VANCOUVER, BRITISH COLUMBIA--(Marketwired - Sept. 11, 2017) - First Mining Finance Corp. (TSX:FF)(OTCQX:FFMGF)(FRANKFURT:FMG) ("First Mining" or the "Company") is pleased to announce the seventh and final set of assay results, comprising 26 drill holes from its Phase 1 infill diamond drill program. 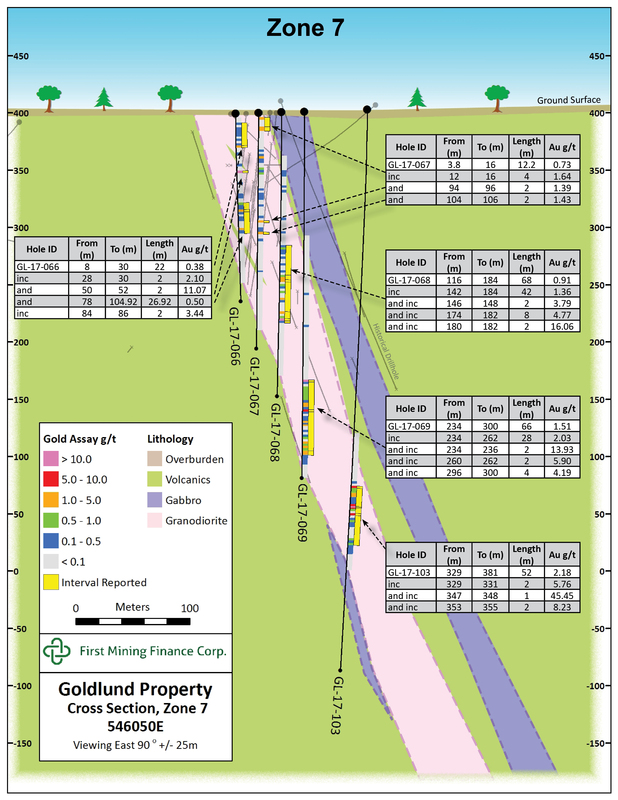 (See Tables 1 and 2) at its 100% owned Goldlund Gold Project ("Goldlund"), located near the town of Sioux Lookout in northwestern Ontario, Canada. Note: Assaying for the Goldlund 2017 drill programs are being done by SGS Canada Inc. at their laboratories in Red Lake, ON. and Burnaby, BC. Reported widths are drilled core lengths; true widths are unknown at this time. Assay values are uncut. 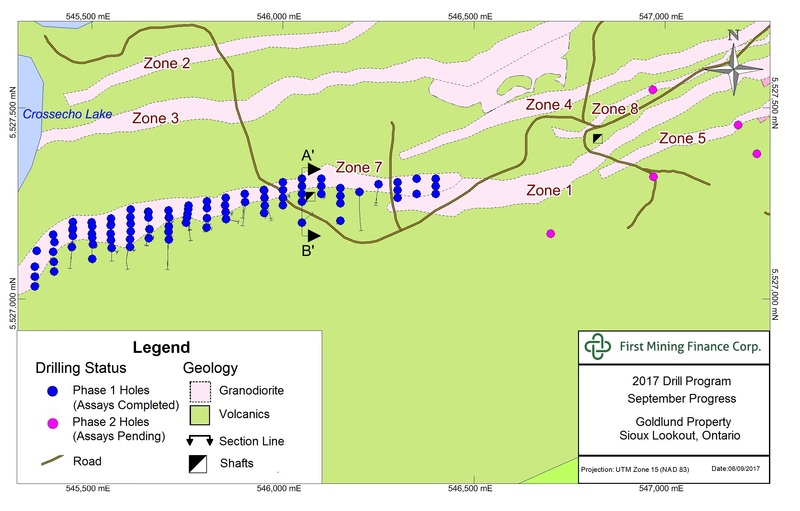 The primary goal of this year's Phase 1 infill drilling campaign at Goldlund was to upgrade Inferred resources into the Measured and Indicated categories and to gain further knowledge of the geology and gold mineralization at Zone 7 and Zone 1 (See Figures 1 and 2). The latest drilling results yielded significant intersections of gold in 17 of the 26 holes. The Phase 1 program is now complete and comprised a total of 100 holes (24,300 metres) of which 87 holes intersected intervals of significant gold mineralization. Based on the success of Phase 1 drilling, First Mining has already commenced a Phase 2 drill campaign to identify new areas of gold mineralization and to expand the overall resource base at the Goldlund property. Data collected from the Phase 1 and Phase 2 drilling programs will be incorporated into the calculation of a new resource estimate, which is expected to be completed in 2018. The Company will provide more specific guidance for the Goldlund resource estimate at a later date. Keith Neumeyer, the Chairman of First Mining, stated, "We are very encouraged by the assay results from the Phase 1 drilling at Goldlund and I believe that further drilling with the Phase 2 program has the potential to add ounces to the existing resource and further advance this project." Given the success of the current drilling campaign the Company has elected to dedicate the majority of its remaining 2017 drilling and exploration budget to the Goldlund Project. Specifically, the company is continuing with its Phase 2 drilling program at Goldlund targeting granodiorite hosted gold mineralization that lies outside of the current resource area. Therefore, given the change in drilling priorities, the company has elected to defer drilling at the Cameron project until 2018 and has also reduced the scale of the drilling program at Hope Brook. At Hope Brook, which is located in the Province of Newfoundland and Labrador, the Company has commenced on a limited exploration diamond drilling program. Drilling at Hope Brook will comprise of three holes for 750 metres and will focus on identifying new areas of mineralization within the Ironbound Hill target which is located approximately 25 kilometers from the main resource area and eight kilometers from Highway 480. The drilling campaign is scheduled for completion later this month and assay results are expected to be released as they become available. Also, the Company has recently acquired two claim groups, the Satterly Lake Claims (the "Claims"), totaling 2,368 hectares, are adjacent to the western edge of the Company's Springpole Gold Project ("Springpole"). The Claim groups collectively consist of 17 claims covering gold mineralization drilled by St. Joe Canada in the 1980s. The Claims also surround the Company's Horseshoe Island claims in the Red Lake Mining District, 12 kilometers southwest of Springpole. Furthermore, First Mining is close to completing an updated Preliminary Economic Assessment ("PEA") for its wholly owned Springpole Gold Project, located in northwestern Ontario and the Company expects to release the results of this PEA by the end of the current quarter. Gold observed during the current drilling program at Goldlund occurs both as fine disseminations in quartz vein stockworks and as more discrete larger grains up to 2 mm spatially associated with pyrite in the quartz veins. Calaverite, a gold telluride mineral, has been noted occasionally in higher grade intervals on fracture surfaces in the quartz veins. Higher grade gold distribution in the granodiorite dike is often, but not always, associated with zones of more intense quartz stockworking and potassic alteration. Figure 2 above displays a cross-section of the geology and gold mineralization with drill holes GL-17-066 to GL-17-069, and GL-17-103. On January 9, 2017, the Company announced an initial mineral resource estimate for Goldlund. At a 0.4 g/t Au cut-off grade, the Goldlund deposit contains pit constrained Indicated Resources of 9.3 million tonnes at 1.87 grams per tonne or 560,000 ounces of gold. At a 0.4 g/t Au cut-off grade, the Goldlund deposit contains pit constrained Inferred Resources of 40.9 million tonnes at 1.33 grams per tonne or 1,750,000 ounces of gold. The technical report for this resource estimate is available under the Company's SEDAR profile at www.sedar.com, and is also available on the Company's website at www.firstminingfinance.com. This news release includes certain "forward-looking information" and "forward-looking statements" (collectively "forward-looking statements") within the meaning of applicable Canadian and United. All statements, other than statements of historical fact, included herein, without limitation, statements relating the future operating or financial performance of the Company, are forward-looking statements. Forward-looking statements are frequently, but not always, identified by words such as "expects", "anticipates", "believes", "intends", "estimates", "potential", "possible", and similar expressions, or statements that events, conditions, or results "will", "may", "could", or "should" occur or be achieved. Forward-looking statements in this news release relate to, among other things: the potential results of the Company's Phase 2 drilling program at Goldlund and the timing of the dissemination of such results by the Company; the views of the Company that the Goldlund project is amenable to bulk mining methods, completion of the Phase 2 drilling program, preparation of a new 43-101 mineral resource estimate for the Goldlund project and the timing for the completion of such a resource estimate, the potential for the Phase 1 and Phase 2 drilling programs to provide further upside to future project economics at the Goldlund project; any upgrade to, or expansion of, the resources on the Goldlund project; and the potential for further value to be unlocked at the project. There can be no assurance that such statements will prove to be accurate, and actual results and future events could differ materially from those anticipated in such statements. Forward-looking statements reflect the beliefs, opinions and projections on the date the statements are made and are based upon a number of assumptions and estimates that, while considered reasonable by the respective parties, are inherently subject to significant business, economic, competitive, political and social uncertainties and contingencies.